The great Cape Cod designs continue with Farm Stand Ranch. The 'Waffle Cut' writing stands out against the white background and works well with the mid-darkness green of the bag. The Chips (presumably Photo-shopped to make sure the little holes are present in all the cavities), look tasty, warm and colorful. A superior crunch to the other two in the range for no apparent reason. Maybe we were used to the idea by the time we tried this third in the line. We would however describe it more as a hearty bite of food than a crisp crunch of a Chip. 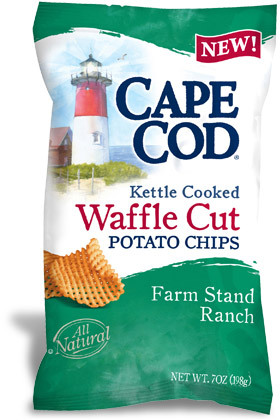 Cape Cod say: "Our double sliced waffle cut chips are made for people who love to crunch. Almost like eating two chips at once, the unique waffle cut lets you taste even more real, hearty potato flavor." We like the idea, but as Chips traditionalists, we would have preferred a more gimmick open manufacturer had made them. We would have appreciated healthier option Popped Chips or Veggie Chips from Cape Cod. There are around thirty ingredients in these 'All Natural' Chips. The third flavor in a range that is proving popular and is likely to grow. The Lattice Cut style of the Chips have come in for some criticism on our review pages, but not for the flavors, all of which have been good. This was no different; a sort of creamy vegetables. There was a sour cream type backdrop to a spicy pepper taste, which may have been the red pepper and vinegar in action.